Rhoelyn: The ship cot creaks as Nysse turns over again. She freezes, hoping that she hasn’t disturbed Rhoelyn. She sighs and stares at the cabin door. Rhoelyn: Nysse grimaces, “I can’t sleep again. I’ll check on Tsume so you can get some rest.” She slips out of bed and tucks the cover around Rhoelyn. Rhoelyn: Nysse smiles, “I’m still sorry that I’ve been disturbing your sleep so much recently. You’ve been so excited this trip.” She takes Rhoe’s hand. Araatris: Smiling back, the smaller woman says, “Well, the excitement does help counter the sleep deprivation. So it’s quite manageable.” She giggles. Rhoelyn: “I had to help with the dye. I still can’t believe that they put a bell on his collar. He was so embarrassed about it.” Nysse covers her mouth. Araatris: The priestess pats her arm with a warm smile. “And you, sister.” She cuddles into the blanket and closes her eyes. “Rhese the pet,” she murmurs. Araatris: The huntress almost shifts closer before her nose stops her. Herbs and something floral. She blinks fully awake, blushing as she pulls her arm away. Rhoelyn: Rhoelyn stirs slightly and mumbles sleepily, “Is it time to wake up, sister?” Nysse clears her throat, “I’ll check…” She slips out of bed. Araatris: Padding on bare feet into the small second chamber of the repurposed captain’s cabin, she blinks and shields her eyes against the morning sun. Araatris: “Oh! Pand-” The priestess pops up, careless in her excitement, and slams her forehead into Nysse’s chin with bruising force. Nysse stumbles back. Rhoelyn: “The village of Sri-la.” Rhoelyn gestures with her free hand. Nysse chuckles, “I see! Here. Let me.” She places her hand on the brush handle. Araatris: The priestess hands over the brush absently, her gaze riveted to the little wooden village that climbs the stone cliffs as it slips out of view. Araatris: “Oh, thank you. Would you please?” The priestess pads over to get her engraved metal hair ornaments and alights smoothly in the window seat. Rhoelyn: The huntress moves behind her. “What do you think they’re like? They didn’t have a lot of information.” Her fingers deftly twist Rhoe’s hair. Araatris: Twisting one of the metal bands in her hands, Rhoe looks up at a colorful streamer kite atop a spire of rock jutting from the bay as she ponders. Rhoelyn: In a companionable silence, Nysse finishes the braids with the metal ornaments and leans next to Rhoe, looking out. There’s a knock on the door. Araatris: The priestess pats Nysse’s shoulder and crosses the room, brushing the wrinkles out of her gown. “Yes?” she asks as she pulls the portal open. Rhoelyn: Davin salutes, “Yes, ma’am. I-We’ll look forward to seeing you on deck.” Rhoelyn shuts the door as he leaves. Nysse leans over giggling. Rhoelyn: Nysse chuckles and begins packing her things in her satchel. “I think you’re right. It’s too much for me sometimes.” Her cheeks darken. Araatris: Despite the blush that creeps from her cheeks to the tips of her ears, the priestess takes Nysse’s hand. “Good. You are my dear sister. Araatris: “I wouldn’t wish to lose you as my family any more than Rhese would.” She smiles warmly at her companion. Araatris: The priestess has the good grace to say nothing, grinning slyly as she pulls out her gear from among a tidy stack of other gowns and accessories. Araatris: Rhoelyn smiles brightly. “Oh, you have so little faith in me. I assure you, I’ve thought of everything, my guardian.” She turns away to change. Rhoelyn: Nysse grins knowingly. “I’ll see you up on deck.” The huntress steps out of the cabin, shutting the door behind her, before heading to the hold. Araatris: Tsume is busy gnawing irritably at the wood of her cage when Nysse rounds the storage containers of trade goods that fill the hold. Her tail wags. Araatris: The wolf disobeys just long enough to get a few extra licks in and sits as Nysse draws breath to repeat the command. She lolls her tongue out. Rhoelyn: “I think your pups have been a bad influence.” Nysse smiles affectionately and rubs her ears. “Let’s get some fresh air.” They head up to the deck. Araatris: Rhoelyn waits on the waist deck, sitting on her trunk as she cranes her neck to look all around at the ocean, the rocky spires, the muddy shallows. Rhoelyn: Nysse chuckles as they join her. “You’re going to strain your neck like that.” The huntress kneels and runs her fingers through Tsume’s fur. Araatris: Rhoelyn stands and brushes imaginary wrinkles from her gown before nodding. “I believe we are, Captain. Nysse?” She clasps her hands together. Araatris: Slanting the sailor a smile as he hefts her trunk, Rhoe says, “We’re grateful, Captain.” She trails the human with Nysse and Tsume at her side. Araatris: “I look forward to meeting him,” Rhoe glances over toward shore, her excitement clear. With a final nod at the captain, she turns back to Nysse. Araatris: “We’ll see you both back here safe and sound for the rendezvous, Ms. Whispersong,” the captain says as Davin is quick to offer Rhoelyn a hand in. Rhoelyn: Davin nods. “Yes, Capt’n!” He lowers them to the water and then pulls out a pair of oars and starts rowing them toward the small docks. Araatris: Rhoelyn quietly watches the village approach, her posture serene, but Nysse recognizes the way her fingers entwine and release in her lap. Rhoelyn: Nysse leans forward and touches the priestess, whispering soothingly in her ear, “We’ll be there soon, Rhoe.” She squeezes her arm lightly. Araatris: Nodding, the priestess doesn’t trust herself to say anything. She just presses a shaky hand over Nysse’s and pulls away to give her a smile. Rhoelyn: They ride quietly to the dock. Davin tosses a rope to a Pandaren to help pull them in and tie off the boat. He climbs out and holds out his hand. Araatris: Rhoelyn lets him help her on to the dock, waiting patiently while Tsume and Nysse hop up. The sailor offers her a late hand with a sheepish grin. Rhoelyn: The huntress waves him off with a grin. “Thanks.” A small group of Pandaren approach, the first of which has reddish fur and a longer tail. Araatris: (c) The woman to his right presses her fist into her hand and bows at the waist. “This is Gingo, leader of this village.” The man smiles and bows. 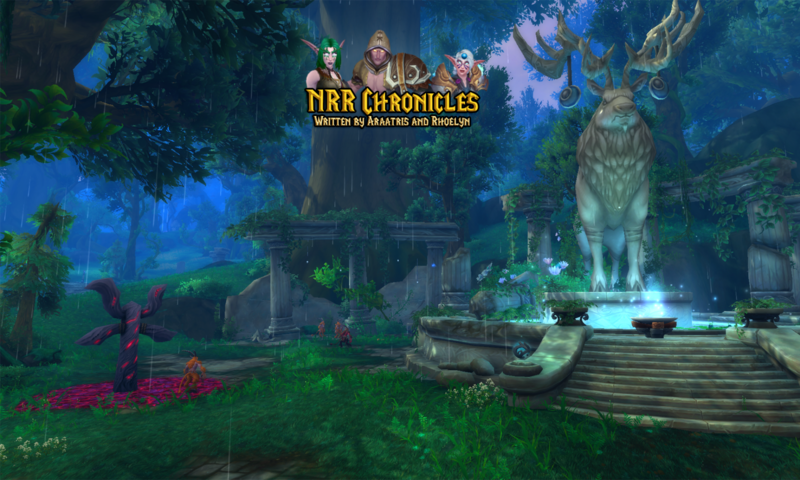 Rhoelyn: (c) and these members of the Stormwind Guard joining us: Sarah Ravenlore, Braden Highlock, Ramona Craven, and Jay Masters.” They each salute in turn. Rhoelyn: They follow, leaving the others to gather their gear. The huntress’ stomach rumbles softly and she blushes, but manages to hold her composure. Rhoelyn: “I am glad it pleases you. It would be our pleasure to show you around before you leave for Greenstone Village.” He gives them a polite smile. Araatris: The priestess smiles, her hands clasped. “I’d love that. I’m very curious about the stonework.” Her eyes drink in the statue carved in the cliff. Araatris: Nysse smiles. “Thank you. She could use a chance to stretch her legs after the long trip.” She gestures, and the wolf wuffs before loping off. Rhoelyn: “Of course. We are happy to accommodate.” Mu Lin and Gingo enter and they follow. A long table with benches sits in the center of the innroom. Rhoelyn: Rhoelyn gathers her gown in one hand and steps over the bench. Nysse quickly stands and holds out her arm, so the priestess can use it as support. Rhoelyn: Nysse flushes. “We’re not blood-related. She is my mate’s twin sister.” She smiles affectionately at Rhoelyn as she sits back down. Rhoelyn: “I’ve learned that in the last few years. Rhoelyn and Rhese are very important to me.” The huntress’ stomach growls again and she ducks her head. Araatris: Rhoelyn smiles at her sister, a soft blush coloring her cheeks. She opens her mouth to speak, but is distracted when Gingo brings a platter in. Araatris: “Not I,” the priestess says, glancing over at Nysse with a fond grin for the anticipatory way her gaze follows him and the food around the table. Rhoelyn: Nysse takes a deep breath, “I’ve never had it, but it smells wonderful!” The huntress stares at the chopsticks by her plate with consternation. Araatris: As Su Le and another Pandaren, plump and matronly, bring out more food, Mu Lin smiles and holds one chopstick up, spearing the dumpling. Rhoelyn: He dips it in the sauce and plops it in his mouth. Nysse grins as the rest of the dishes are brought out and now rest in the center of the table. Araatris: With everyone settled, Lana smiles and admonishes them. “Eat! Eat!” The visitors do, enjoying the contagious gusto with which the Pandaren partake. Rhoelyn: Rhoelyn giggles as the Pandaren start experimenting with Nysse, having her try dish after dish. Tsume sneaks in and lays by Nysse’s feet. Araatris: At length, she leans against the table, watching happily as the huntress laughs with Su Le over something, her fingers idly tapping her mug. Araatris: The serpent rider glances over at Lana, who grins and nods. “Perhaps she will like grilled boar?” At Nysse’s nod, the woman goes to the fetch it. Araatris: “Oh, yes.” She leans forward, excited. “I would love that. Tea is a favorite of mine.” The others follow her lead, though with less enthusiasm. Araatris: Nysse covers her mouth to suppress a laugh at the predictable gleam in Rhoe’s eye. “Uh-oh. You mentioned herbs…” She grins teasingly. Rhoelyn: Mu Lin laughs, “After tea, I’ll ask Lana to show you the garden.” Rhoelyn smiles. “Really?” Her gaze seeks out Lana at the far end of the table. Araatris: The matron is hard at work showing Davin the right way to use his chopsticks. She glances around the table, pleased to see many happy expressions. Rhoelyn: The huntress leans and whispers to Rhoelyn, “I hope the trip stays like this, but I can’t wait to stretch my-” Tsume noses under Nysse’s hand. Araatris: The title has her blushing a bit. “Just Rhoelyn, friend. Or priestess, if you prefer. My people eschewed noble titles aeons ago.” She stands. Araatris: The priestess adds her wave to his before happily leading the way outside, leaving Davin and the guards scrambling after her.